Hope for heart patients: Breakthrough result! 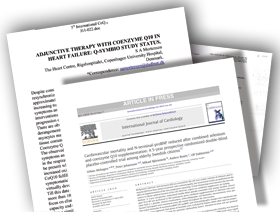 Q-Symbio, a large international study of heart patients has now been completed, and the study has just been published in the respected Journal of the American College of Cardiology (JACC). The study was first presented at a major cardiology congress in Lisbon and was subsequently the most cited on the Congress. Chief Physician Dr. Svend Aage Mortensen from Copenhagen University Hospital has been the head of the study, which was carried out in hospitals in Denmark, Sweden, Poland, Austria, Hungary, Slovakia, Malaysia, Australia and India. He expects Q10 to become part of future treatments for patients who lack this natural substance. A substance which the body produces, but where production is declining with age. That JACC has decided to publish the study is according to Dr. Mortensen a breakthrough because it is one of the most influential journals for cardiologists. It also shows that JACC have emphasised the exceptional results with Q10 treatment. Q10 Pharma Nord is available in pharmacies and health food stores. Q10 Pharma Nord has been chosen for the Q-symbio study because this is the brand that is used as the official reference product for the International Coenzyme Q10 Organisation. It has also been used in more than 100 published scientific studies. The product has demonstrated good bioavailability and effect, and at the same time there has been collected safety data for nearly 25 years. Q10 exists in two active forms, the oxidized ubiquinone and the reduced ubiquinol. Both forms are present in the mitochondria, the cells' energy factories. Here Q10 continuously changes between these two forms, oxidized and reduced and this characteristic is essential for Q10's effects in the body. Pharma Nord's Q10 is dissolved in oil and heat-treated in a special way so that the Q10 crystals dissolve completely at body temperature and produces a uniform (homogeneous) mixture. This results in easy absorption in the body. As the body will convert oxidized Q10 (ubiquinone) to the reduced form (ubiquinol) shortly after ingestion it usually does not matter which form of Q10 you use. Ubiquinone and ubiquinol constantly shift from one form to the other depending on the bodys needs. To date, almost all documentation on the efficacy and safety are done using the oxidized form, ubiquinone, which is also the reason why Dr. Mortensen chose to use ubiquinone for the Q-symbio study. It is a misconception that the one form of Q10 should be more active or better than the other, but the two forms have partial different tasks in the body. The type of Q10 that is produced in the liver, is the oxidized ubiquinone. Q10 from our food is also the oxidized form. Actually the oxidized ubiquinone changes to ubiquinol (the reduced form) when it is being absorbed in the intestinal wall. Click here to read more about Q10 Pharma Nord!